While compact discs appear to handle rough treatment will no ill effects, the truth is that improper handling can degrade the sound and shorten the life of your compact discs. Improperly handled discs can easily become scratched and dirty. Scratched and dirty discs tend to have reduced sound quality because your player's error correction can only guess at the sound information that is unreadable under the dirt and scratches. Over time the build up of dirt and scratches can cause your discs to skip and may eventually render them totally unplayable. Proper handling and storage (and an occasional cleaning when absolutely necessary) will keep your compact discs sounding their best and allow them to last as long as possible. Proper handling and storage of your compact discs will minimize the amount of dust, dirt and grime that may come in contact with them. Consistent use of these CD handling and storage guidelines will help perserve your compact discs and make it less likely that you will ever need to clean them. Handle discs only by their outer edge or center hole; avoid touching the disc surfaces. When not in use, keep discs in their jewel case or other protective covering. Keep discs out of direct sunlight. Avoid exposing discs to extreme temperatures. Make sure discs are at room temperature before using them. Keep discs away from dust, dirt, sand, and moisture. Do not write on the surface of a disc with a pencil, pen or other hard object (if you must mark on a disc, use only soft-tip pens with water based ink). Compact disc cleaning is only recommended if your discs are not functioning properly, since excessive or improper cleaning may scratch and permanently damage your discs. However, if you are experiencing skipping, poor sound quality or other problems while playing a disc, the cause could be dust or dirt on the disc, and a proper CD cleaning may restore it to perfect operation. New compact discs can sometimes have debris on them which causes them to skip or not function properly. Before returning a new compact disc that appears to be malfunctioning, try cleaning it first. Note - Clean only the bottom (non-labeled) side of the disc. Dirt on the top (labeled) side of the disc will not effect playback. Also, the plastic coating on the top side is very thin and can be easily damaged (which will effect playback). 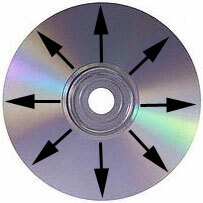 The best way to clean compact discs is by spraying them with compressed air. Cans of compressed air are available from many computer and camera stores. Try to spray off any noticeable dust or debris. Compressed air should not harm the disc's surface and should remove most accumulations of dust and large dirt particles. Test play your disc after spraying. In many cases spraying alone should solve your problem. If spraying with compressed air fails to solve your problem, physically wiping the disc may be necessary to remove the dirt and grime. Disc wiping can be done either wet or dry, the choice is up to you. Dry wiping will not leave a residue, however it could trap dirt particles and grind them into the surface. Wet wiping should be more effective at loosening stuck-on particles and it should be less likely to grind particles into the surface, however, it can leave a residue if not done properly and a poor choice of cleaning solution can permanently damage the disc's surface. For wet wiping, soapy distilled water is the recommended cleaning solution. Caution - If you decide to use a cleaning solution, do not use solvents (like alcohol, benzene, paint thinner, record cleaner, or anti-static aerosol spray) or abrasive cleaners. Use a soft, non-abrasive, lint-free cloth, chamois or sponge (many companies make products for this purpose). Make sure the cloth, chamois or sponge is clean and does not contain any dirt or abrasive particles that could scratch the disc. Always wipe the disc from the center to the outer edge in a straight line - Never wipe in a circular motion. Avoid using excessive pressure on the disc surface. Use the minimum amount of wiping necessary to remove the dirt and grime (if possible try to wipe only the affected area of the disc).